Home >> Articles >> What is Xingyiquan? In order to survive in what is oftentimes a violent and cruel world, animals must very quickly develop the ability to protect themselves from natural dangers and other animals. In order to survive in what is oftentimes a violent and cruel world, animals must very quickly develop the ability to protect themselves from natural dangers and other animals. All wild animals still have the instincts and senses for this. They all still know how to hunt and fight to survive. These abilities require physical strength, a natural, instinctively perceptive mind, and a highly alert spirit. For example, an eagle must have sharp eyes and claws. A tiger doesn’t just need a strong body and claws, it must also have the spirit which makes other animals afraid of it. We humans have lost most of the natural instincts, senses, and fighting abilities that all other animals possess. In order to regain these abilities and use them to fight against other men, the martial artists in ancient times imitated the fighting techniques and spirits of animals, modifying them with human rational analysis. This is how many different styles were created. Xingyiquan was created in imitation of the fighting techniques and spirit of twelve animals. One of the documents which are available to us contains a section which explains what Xingyiquan is. We would like to translate it here and make some comments. Hopefully this will give you a clear concept of Xingyiquan. The history of the martial arts before the Qing Dynasty (1644 a.d.) is very vague because almost all of the Chinese martial artists were conservative and the styles were passed down secretly. It is the same with Xingyiquan. According to most of the available documents, the origin of Xingyiquan should probably be dated at least as far back as the Liang Dynasty (502-557 a.d.) at the Shaolin Temple. This is because, at this time, the Shaolin Temple was already imitating the movements and fighting spirit of five animals in their martial arts training. Later, during the Southern Song Dynasty (1127-1280 a.d.), it is believed that Zhang, San-Feng combined the concepts of Shaolin martial arts with his own understanding of Qi and created Taijiquan. In fact, many Xingyiquan practitioners believed that Xingyiquan originated at Wudang Mountain, the same as Taijiquan did. Since the late Southern Song Dynasty, when the soldiers in Marshal Yue’s army were trained in Xingyiquan, the art has become very popular, and Marshal Yue is frequently credited with creating the art. However, since his martial arts originally came from the Shaolin Temple, many people trace Xingyiquan’s ancestry back to the Shaolin Temple. Between the Song and the late Ming Dynasties, the history of Xingyiquan is again unclear. During the Qing Dynasty (1644-1912 a.d.), Xingyiquan became more popular because the mind of the Chinese people was more open, due in part to the more frequent contacts with Western culture. Consequently, its history during this period is better known. Generally, it is believed that a martial artist named Ji, Ji-Ke(nicknamed Long-Feng) of Pu Zhou, who traveled and visited the well known masters in the mountains of Sichuan and Shanxi Provinces, obtained on Zhong Nan Mountain a secret book on Xingyiquan written by Marshal Yue. After he studied the art for some time, he passed it down to his disciple Cao, Ji-Wu, who in turn passed it down to Ji, Shou and Ma, Xue-Li. Ji, Shou later published Yue’s book and popularized the art even more. There have been many famous Xingyiquan masters since then. From then (Qing Tong Zhi, 1862-1875 a.d.) until now, countless people have learned Xingyiquan. Here we can only name some of the best-known ones. There were Dai, Long-Bang and his brother Dai, Ling-Bang who learned from Ma, Xue-Li during the Qing Xian Feng period(1851-1862 a.d.). Then they passed the art down to Li, Luo-Neng. Li, Luo-Neng then passed it down to many of his students, the better-known ones being Song, Shi-Rong, Che, Yong-Hong, Liu, Qi-Lan, Guo, Yun-Shen, and Bo, Xi-Yuan. Among these five, Liu, Qi-Lan had many students such as his three sons, Liu, Jin-Tang, Liu, Dian-Chen, Liu, Rong-Tang, and students Li, Cun-Yi, Zhou, Ming-Tai, Zhang, Zhan-Kui, Zhao, Zhen-Biao, and Geng, Ji-Shan. Also, Guo, Yun-Shen passed down his arts to Liu, Yong-Qi, Li, Kui-Yuan, and Qian, Yan-Tang. In the beginning of this century, when the Qing emperor fell and the republic was organized by Dr. Sun, Yat-Sen, the entire country entered a new era. As the nation gradually became more open-minded, the traditional secrets were more easily revealed to the public, and an enormous number of people took up Xingyiquan. For example, Li, Cun-Yi and Zhang, Zhan-Kui had a great many students, among them Li, Yun-Shan and Shang, Yun-Xiang. Shang, Yun-Xiang’s student Jin, Yun-Ting was a well known Xingyiquan promoter fifty years ago. Also, Li, Kui-Yuan’s student Sun, Lu-Tang was well-known as a Taijiquan, Xingyiquan, and Baguazhang master. Finally, Zheng, Huai-Xian learned from Sun, Lu-Tang and passed his arts to master Liang, Shou-Yu. You can see that a chart of the generations of Xingyiquan masters would be very complicated. Keep in mind, also, that there are probably at least ten times as many people who also reached a high level of mastery, but are not well-known because they did not share their knowledge so generously with the public. This implies that the people mentioned were not necessarily the best Xingyiquan players of their time. A similar thing happened with Taijiquan. A great many people throughout the world know about Yang, Cheng-Fu and his style of Taijiquan, but fewer people know about his uncles and the generation older than his uncles whose techniques were said to be much higher than his. Because the origin of Xingyiquan is so unclear, many martial artists would therefore credit Marshal Yue, Fei with its creation. There are several reasons for this. 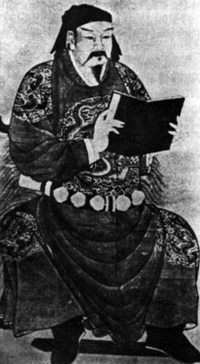 First, Marshal Yue, Fei was a Chinese hero and is respected by all Chinese. Second, Yue, Fei’s martial arts came from the Shaolin Temple, which is considered the origin of both the internal and external styles. Third, Yue, Fei’s ten theses on Xingyiquan demonstrate a very deep understanding of the art. Even though he may not be the creator, his theses have shown us the correct way to master the art. Fourth, Yue, Fei compiled and organized the Xingyiquan style into an effective martial system to train his soldiers. He is believed to be the first person to reveal the secrets of Xingyiquan to the public. Fifth, Yue, Fei was not only an expert in martial arts, he was also well known as a Qigong master. He is credited with creating the Eight Pieces of Brocade (Ba Duan Jin), which is a medical Qigong set for health, and the external martial style Yue Jia Ying Zhua (Yue Family’s Eagle Claw). It is believed that only a person who was an expert in both Chinese medicine and martial arts would be able to combine them to create these styles. Because of these reasons, and because almost all of the theory and principles in Xingyiquan are based on Yue, Fei theses, we will continue the next article with a brief biographical sketch of Marshal Yue, Fei.